This is my 100th entry. Wow...I have come a long way, haven't I? It's a good thing that I have written for so long. That means that at least my life is interesting enough for me to blog about :) Hopefully, life from this 100th blog entry on would continue to be interesting enough to blog about. All right, let's get down to business. 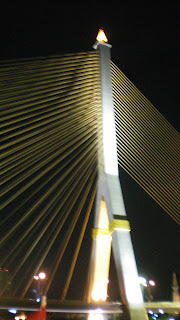 I am dedicating this blog to all the Thai friends and South East Asians and anyone who wants to visit Bangkok, Thailand. First off, I haven't always had an interest in traveling around the South East Asian countries. It just wasn;t in my to-do list. But then, I came back from the US and decided that the world is large and there are so many countries and people to see. Life is a waste if I only choose to travel to the first world countries. The third world countries have so freaking much to offer also!! So, I decided to book the plane tickets despite how expensive it cost me (I didn't have a job when I first got home). Thanks to AirAsia, I found some pretty cheap tickets (still pretty costly for me back then). Leighton and I were so excited about the trip even before he got to Malaysia. I researched about all the places of interest that I wanted to go to. 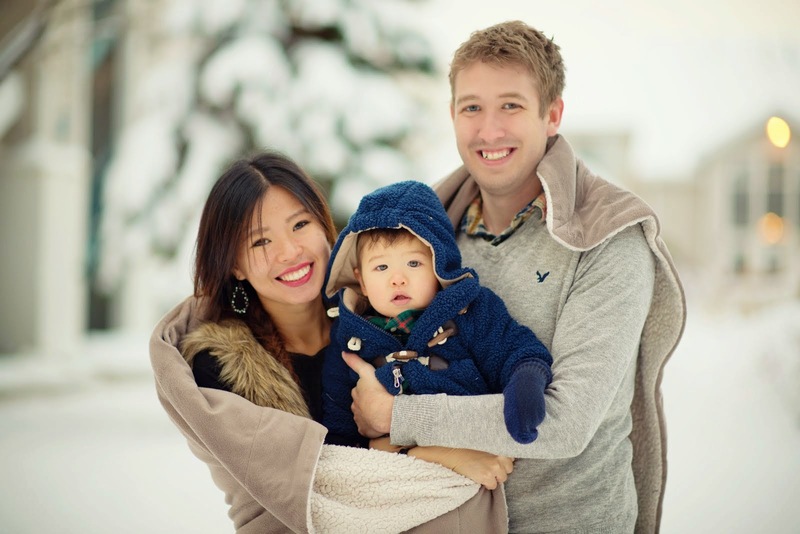 Not only did we managed to accomplished to do so many things on our list in just three days, we were able to find out something valueble these Thai people offered. 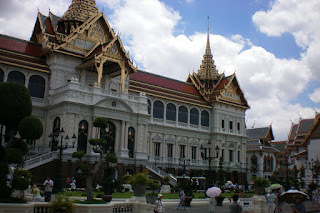 Most of the big buddhist temples in Bangkok City. 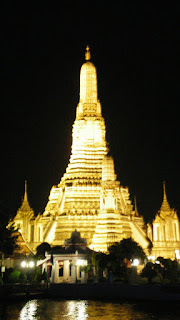 We have heard so much about how many temples there are in Thailand. 95 percent of the population are Buddhists. Their temples are HUGE and beautiful. It was so amazing to see their love for their religion. It was a very spiritual trip for us. What are the must see temples? 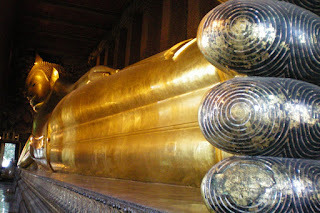 Wat Pho--the 90 feet reclining Buddha that you see in Street Fighter, Wat Arun--the one we saw on the cruise down the Chao Phraya river at night, The Grand Palace and the Emerald Buddha--the Buddha has three clothing made of gold for the cold, hot, and rainy season. Tut-tut ride If you want to experience Bangkok, you gotta get on one of those tricycle that looks like a cab. They called it Tut-tut. It is FREAKING cheap!! only USD0.30 per person. 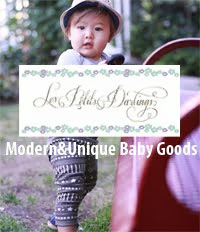 Though they only take you to short distance places, they are worth a try! You can experience how crazy Bangkok drivers drive. I was sure I wasn't gonna survive the ride. But hey, i guess my time on earth wasn't up yet. Yours Truly in the tut tut! So glad that I was still living. Thai Massage It is the best treatment for your body. It is REAL cheap too! A full body massage cost about 250 Thai bhat--which is RM25 and USD8 per hour. I don't think I can find cheaper deal anywhere else! It was the first time Leighton and I had our full body Thai massage. We were waiting to get on our cruise, but we needed to wait for an hour. So, what did we decide to do?? We just asked someone in the hotel where we can find the Thai massage. There are actually many Thai massage places in Bangkok. Almost everywhere we went, we saw one. 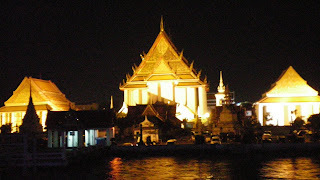 In the end of our first day, we went on the Romantic Chao Phraya cruise. It was a dinner cruise. My friend's mom made a reservation for us on the cruise the day before. So, we got a nice spot. The night view of Bangkok was breathtaking. 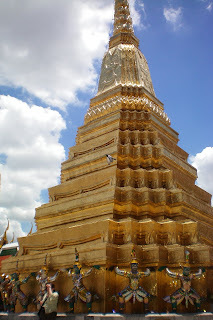 It wasn't the tall buildings that captured our interest, but the huge and gold temples that had our attention. Along the river, we saw many temples in the distance. 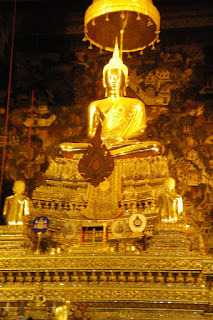 The darkness also made the temples looked more gold than in the morning. 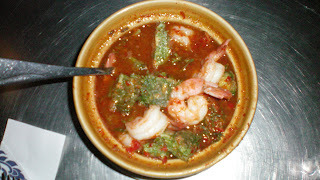 The Thai curry that we ordered and the fresh fish and seafood were mouth-watering though the curry was too spicy to our taste. We also ordered Leighton's favorite fried rice. Well, I think i talked too much..the entry is getting longer. I am gonna stop here but I will be back for the second and third day of our trip. If you wanna know more about what you can do in Bangkok, you MUST come back for more :) If you wanna see more pictures (i have hundreds more), please let me know and I will send you the link to them. 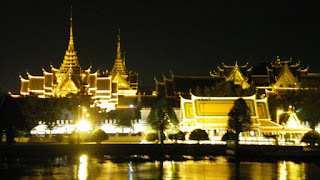 We booked a Bangkok day tour with Thai Private Tour Guide. Thanks goes to guide for a great day out in Bangkok, visiting temples and markets to get a feel for the city and learn it's rich history. Right from the booking process it was very easy to arrange www.privatetoursinistanbul.com once greeted us for the day, we felt like she'd really take care of us. We had a range of experiences, even using every transportation means available so we knew the lay of the land on subsequent days. There were temples, a boat tour and walk through a market. 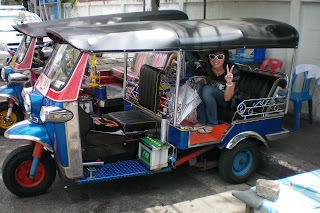 he wasn't just a chauffeur; she explained the history, symbolism and significance of places we visited and aspects of Bangkok and Thailand in general. You have a very interesting blog! I will also go to Thailand next week. My parents were there last year. 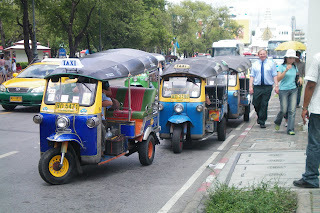 They stopped in Chiang Mai, where they rented motorbikes for them http://catmotors.net/, to make them moving much easier around the city. They were delighted with this trip and made a lot of beautiful photos there!